Fill out the form to register for Lobby Day! 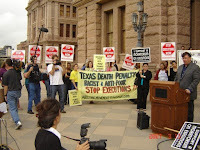 Every Texas legislative session since 2003, the anti-death penalty community in Texas has rallied at the Texas capitol to lobby legislators to end the death penalty. The picture above is from Lobby Day 2007. 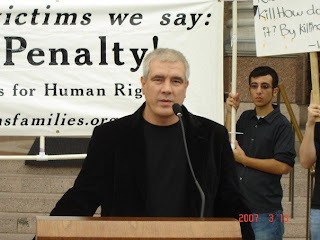 In 2009, there have already been several bills filed that we will be lobbying in favor, including a bill to end the death penalty under the Law of Parties, an abolition bill, a death penalty study commission and moratorium on executions bill, a resolution to impeach Sharon Keller and other issues. Below is the tentative schedule. We will announce more details and the rooms for all events later. You do not have to attend all events. In addition to the Austin training on the morning of Lobby Day, there is a Houston training session on Saturday, March 14, at S.H.A.P.E. Center, at 3903 Almeda, from 2:00 until 4:00 pm. It is organized by Texas Death Penalty Abolition Movement and conducted by aides to State Rep Dutton and State Rep Farrar.